Federal prosecutors are laying out what they call a massive college admissions scheme. Fifty people, including Hollywood actresses Felicity Huffman and Lori Loughlin, have been indicted by the FBI and the U.S. attorney's office in Boston in an alleged far-reaching bribery scheme that involved college athletic coaches and college entrance exam administrators — nabbed in a bust that was dubbed by feds as "Operation Varsity Blues." Court documents, which were unsealed Tuesday morning, allege that the accused aimed to facilitate students getting into high-profile D-1 schools, including Georgetown, Stanford, UCLA, Yale, University of Texas, University of San Diego, University of Southern California and Wake Forest as recruited athletes regardless of their athletic ability. Some of those who were indicted included college coaches, but there's no indication the schools were involved, according to NBC News. However, authorities advised that more charges could be coming. At least nine athletic coaches and 33 parents, many of them prominent in law, finance or business, were among those charged in the investigation. Hollywood actresses Felicity Huffman and Lori Loughlin are among those charged in connection with the scheme; both were charged with fraud and conspiracy. Loughlin's husband, Target clothing line designer Mossimo Giannulli, was also indicted. Huffman's husband, actor William H. Macy, was mentioned in court paperwork, but he has not been charged. Dozens, including Huffman, were arrested by midday. The California judge said she could be released on $250,000 bond. Loughlin is not yet in custody, as she had been out of the country for work. Law enforcement sources told NBC News that she was scheduled to return to Los Angeles from Canada late Tuesday, and that she was expected to surrender to federal officials sometime in the next 24 hours. "There will not be a separate admissions system for the wealthy, and there will not be a separate criminal justice system, either," U.S. Attorney Andrew Lelling said Tuesday morning. Federal prosecutors allege wealthy parents paid "enormous sums" to guarantee their children's admission to elite universities. 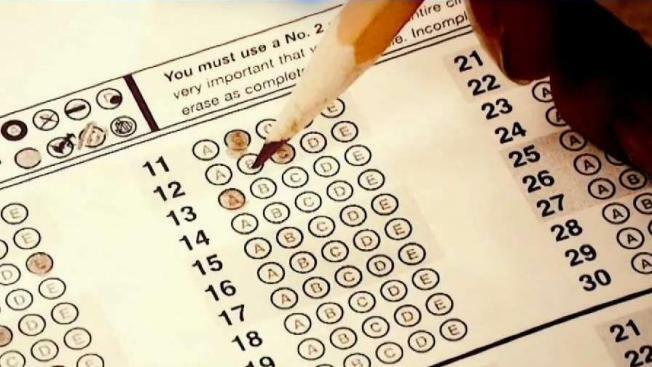 The students would allegedly be labeled as recruited athletes when they were not — with some going as far as photoshopping their faces onto stock sports images — by a consulting company at the heart of the scheme, which is also accused of bribing college entrance exam administrators to let a Florida man to take the tests on the students' behalf or replace their answers with his own. The scandal also included acts of alleged tax fraud, after the owner of the consulting company, William Rick Singer, agreed to shield the payments for bribes as charitable contributions to his company's non-profit, called Key Worldwide Foundation, which allowed the wealthy parents to write off the bribes on their taxes, according to prosecutors. No students were charged. Authorities said in many cases, the teens were not aware of the fraud. One of the unsealed court documents included indictments against former Yale University women's soccer coach Rudolph "Rudy" Meredith, who has been charged with two counts of wire fraud. Prosecutors allege that Meredith conspired with Singer, the owner of Edge College & Career Network and the accused central schemer, to take bribes from the parents of college hopefuls. In one case, Meredith and Singer allegedly worked together to have a Yale applicant, whom did not have a background in competitive soccer, to have an athletic profile that described her as a "co-captain of a prominent club soccer team in southern California." Meredith received a check for $400,000 after the student was admitted to Yale, and the relatives of the student ultimately paid Singer about $1.2 million in multiple payments, according to court documents. Meredith pleaded guilty to charges and helped build the case against others, according to prosecutors. In all, Singer's company allegedly received payments totaling at least $25 million from 2011 until last month to facilitate the scheme. Singer pleaded guilty to charges of racketeering, money laundering, conspiracy to defraud the U.S. and obstruction of justice in Boston's federal courthouse hours after the bribery scheme was unveiled on Tuesday. Stanford University's former head sailing coach John Vandemoer also pleaded guilty on Tuesday. In a statement, the NCAA said it will look into claims made against college coaches and administrators in the admissions bribery scandal, adding that the "charges brought forth today are troubling and should be a concern for all of higher education." Loughlin and her husband allegedly gave $500,000 to have their two daughters labeled as recruits to the University of Southern California crew team, even though neither participated in the sport. Their 19-year-old daughter, Olivia Jade Giannulli, who has a popular YouTube channel, attends USC. Court papers said a cooperating witness met with Huffman and Macy at their Los Angeles home and explained to them that he "controlled" a testing center and could have somebody secretly change her daughter's answers. The person told investigators the couple agreed to the plan. Authorities did not say why Macy was not charged. Toby MacFarlane, of Del Mar, California is a former executive of a title insurance company. His daughter was notified of her admission to USC in February 2017 as a student athlete, prosecutors outline in the formal complaint. The defendant’s daughter graduated from USC in 2018 without playing soccer for the university. MacFarlane’s son was admitted to USC as a student athlete in 2017. As part of his application prosecutors allege an online profile was created describing the teenager as a 6-foot-1 basketball player when the student was actually 5-feet, 5-inches tall. He withdrew from the university in May 2018 without playing basketball for the university. Elisabeth Kimmel, of Las Vegas, Nevada, and La Jolla, California, was the owner of a media company in San Diego. She is accused of conspiring to get her daughter into Georgetown and her son into USC. Kimmel’s daughter said she was a ranked tennis player when she applied to Georgetown, according to the complaint. Prosecutors say the U.S. Tennis Association has no record of Kimmel’s daughter’s participation. The defendant’s daughter entered Georgetown in 2013 and graduated in 2017. She was not a member of the tennis team at the university. The defendant’s son’s application described him as a 3-year varsity letterman in track and field as well as one of the top pole vaulters in California, according to the complaint. Prosecutors say there was no school record of Kimmel’s son participating in track and field in high school. In July, after their son’s visit to USC for orientation, the Kimmels were recorded in a phone call describing how their son was approached by a university advisor asking about his participation in track and field. Elisabeth Kimmel allegedly said, “so we have to hope this advisor doesn’t start poking around?” according to the complaint. NBC 7 San Diego has attempted to contact both families to get reaction to the indictment. The University of Southern California says it has fired two employees who were indicted in the scheme — senior associate athletic director Donna Heinel and water polo coach Jovan Vavic. Court documents say Vavic was paid $250,000 and designated two students as recruits for his water polo team to facilitate their admission to the university. Prosecutors allege Heinel also helped facilitate admissions after she was paid bribes. USC says it reviewing its admissions procedures. Robert Flaxman of Beverly Hills, California owns a real estate company. In the complaint, prosecutors say Flaxman was recorded discussing the process his son got into the University of San Diego via a “side door.” His son entered USD in 2016 and his daughter took the college entrance exam later that year. Prosecutors allege the defendant’s daughter was helped by proctors involved in the scheme and was given answers which would help her score well on the exam. In response to the allegations, a spokesperson for the University of San Diego told NBC 7 the school has been cooperating with the Department of Justice’s investigation. “We have no reason to believe that any members of our admissions team, our administration or staff, or our current coaching staff were aware of or involved in the alleged wrongdoing. We believe the federal government agrees with this assessment,” a university spokesperson said Tuesday. Among the coaches charged in the scheme is former Georgetown University coach Gordon Ernst, who is now the head women's tennis coach for the University of Rhode Island. URI released a statement regarding Ernst's indictment. "The University has placed Ernst on administrative leave while it continues to review the matter. Ernst was hired by URI in August 2018 as head coach. He has not been involved in the recruitment of any current players nor in the signing of any new recruits." Details of the massive criminal bust have surfaced right in the midst of the hectic college admissions cycle. Even though federal prosecutors have not implicated the schools in the alleged wrongdoing, the scandal is likely to spark a lot of questions on campuses. Sandy Lish, a crisis communications expert with Boston-based The Castle Group, said there is likely a lot of scrambling happening behind the scenes at the affected universities. "Schools who admitted students potentially fraudulently have a lot of stakeholders to answer to," Lish explained. "They have the parents of students who weren't admitted. They have the parents who are on campus for visits now who are wondering exactly what’s going on and how reputable the process is." Lish said it will be interesting to see if the schools form a unified response in how they handle the situation. According to federal prosecutors, many of the students connected to the scheme are currently enrolled. Lish also wondered whether applicants who were not accepted to the colleges will pursue any kind of legal class action.